Eastham is inspired by summers spent at my grandmother's cottage on Cape Cod. The smell of cut grass and pine needles, the feel of the sun warming the top of my head, the sound of buzzing crickets and sneakers crunching on gravel – these instantly transport me back to the freedom of childhood summers. I wanted to capture the joyful simplicity and untamed beauty of New England, especially that brief, bittersweet time between the end of Summer and the beginning of Fall. Eastham inspires a feeling of nostalgia for what has come before mixed with the anticipation of what is to come next. Eight versatile designs in three evocative colorways (Thistle, Bittersweet, Juniper) will inspire your timeless creations. From FreeSpirit Fabric. 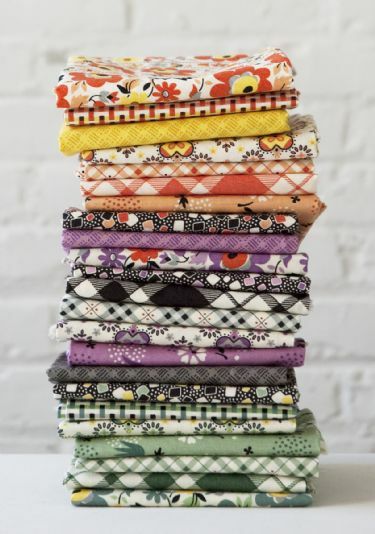 Check out our Calico Swing quilt pattern – a fat quarter bundle plus some coordinating solids – will make up to a king size quilt.